The region takes its name from that of the Carib, an ethnic group present in the Lesser Antilles and parts of adjacent South America at the time of European contact. The United Nations geoscheme for the Americas accords the Caribbean as a distinct region within The Americas. 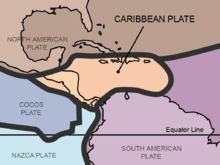 Physiographically, the Caribbean region consists mainly of the Caribbean Sea to the north, bordered by the Gulf of Mexico, the Straits of Florida, the Northern Atlantic Ocean which lies to the east and northeast, and a chain of islands surrounding the Caribbean Sea; the coastline of the continent of South America lies to the south. Politically, "Caribbean" may be centred on socio-economic groupings found in the region. For example the block known as the Caribbean Community (CARICOM) contains both the Co-operative Republic of Guyana and the Republic of Suriname found in South America, along with Belize in Central America as full members. Bermuda and the Turks and Caicos Islands which are found in the Atlantic Ocean are associate members of the Caribbean Community, and the same goes for the Commonwealth of the Bahamas which is a full member of the Caribbean Community. Alternately the organisation known as the Association of Caribbean States (ACS) consists of almost every nation in the surrounding regions which lie on the Caribbean plus El Salvador which lies solely on the Pacific Ocean. According to the ACS the total population of its member states is some 227 million people. Portuguese West Indies – present-day Barbados, known as Os Barbados in the 16th century when the Portuguese claimed the island en route to Brazil. The Portuguese left Barbados abandoned in 1533, nearly a century prior to the British arrival to the island. 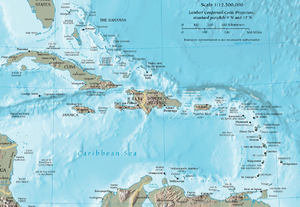 Spanish West Indies – Cuba, Hispaniola (present-day Dominican Republic, Haiti (until 1609 to France)), Puerto Rico, Jamaica (until 1655 to Great Britain), the Cayman Islands (until 1670 to Great Britain) Trinidad (until 1797 to Great Britain) and Bay Islands (until 1643 to Great Britain), coastal islands of Central America (minus Belize), and some Caribbean coastal islands of Colombia, Mexico, and Venezuela. Swedish West Indies – present-day French Saint-Barthélemy and Guadeloupe (briefly). The British West Indies were united by the United Kingdom into a West Indies Federation between 1958 and 1962. The independent countries formerly part of the B.W.I. still have a joint cricket team that competes in Test matches, One Day Internationals and Twenty20 Internationals. The West Indian cricket team includes the South American nation of Guyana, the only former British colony on that continent. For the fungi, there is a modern checklist based on nearly 90,000 records derived from specimens in reference collections, published accounts and field observations. That checklist includes more than 11250 species of fungi recorded from the region. As its authors note, the work is far from exhaustive, and it is likely that the true total number of fungal species already known from the Caribbean is higher. The true total number of fungal species occurring in the Caribbean, including species not yet recorded, is likely to be far higher, given the generally accepted estimate that only about 7% of all fungi worldwide have so far been discovered. Although the amount of available information is still very small, a first effort has been made to estimate the number of fungal species endemic to some Caribbean islands. For Cuba, 2200 species of fungi have been tentatively identified as possible endemics of the island; for Puerto Rico, the number is 789 species; for the Dominican Republic, the number is 699 species; for Trinidad and Tobago, the number is 407 species. The region's coral reefs, which contain about 70 species of hard corals and between 500–700 species of reef-associated fishes have undergone rapid decline in ecosystem integrity in recent years, and are considered particularly vulnerable to global warming and ocean acidification. Two stenopus hispidus banded cleaner shrimp on a xestospongia muta barrel sponge. Cyphoma signatum (Fingerprint Cowry) pair of marine animals, off coastal Haiti. The Martinique Amazon, Amazona martinicana, was a species of parrot in the Psittacidae family. It is now extinct. Hemidactylus mabouia, a tropical gecko, Dominica. The population of the Caribbean is estimated to have been around 750,000 immediately before European contact, although lower and higher figures are given. After contact, social disruption and epidemic diseases such as smallpox and measles (to which they had no natural immunity) led to a decline in the Amerindian population. From 1500 to 1800 the population rose as slaves arrived from West Africa such as the Kongo, Igbo, Akan, Fon and Yoruba as well as military prisoners and captured slaves from Ireland, who were deported during the Cromwellian reign in England. Immigrants from Britain, Italy, France, Spain, the Netherlands, Portugal and Denmark also arrived, although the mortality rate was high for both groups. The population is estimated to have reached 2.2 million by 1800. Immigrants from India, China, and other countries arrived in the 19th century. After the ending of the Atlantic slave trade, the population increased naturally. The total regional population was estimated at 37.5 million by 2000. The majority of the Caribbean has populations of mainly Africans in the French Caribbean, Anglophone Caribbean and Dutch Caribbean, there are minorities of mixed-race and European peoples of Dutch, English, French, Italian and Portuguese ancestry. Asians, especially those of Chinese and Indian descent, form a significant minority in the region and also contribute to multiracial communities. All of their ancestors arrived in the 19th century as indentured laborers. The Spanish-speaking Caribbean have primarily mixed race, African, or European majorities. 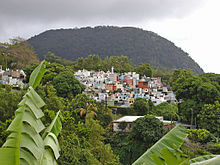 Puerto Rico has a European majority with a mixture of European-African (mulatto), and a large West African minority. One third of Cuba's (largest Caribbean island) population is of African descent, with a sizable Mulatto (mixed African–European) population, and European majority. The Dominican Republic has mixed majority, primarily descended from West Africans, Spaniards, and Amerindians. Larger islands such as Jamaica, have a very large African majority, in addition to a significant mixed race, Chinese, Europeans, Indian, Lebanese, Latin American, and Syrian populations. This is a result of years of importation of slaves and indentured labourers, and migration. Most multi-racial Jamaicans refer to themselves as either mixed race or simply Black. The situation is similar for the Caricom states of Guyana, Suriname and Trinidad and Tobago. 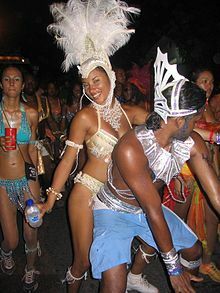 Trinidad and Tobago has a multi-racial cosmopolitan society due to the arrival of the Africans, Indians, Chinese, Syrians, Lebanese, Native Amerindians and Europeans. This multi-racial mix has created sub-ethnicities that often straddle the boundaries of major ethnicities and include Chindian and Dougla. 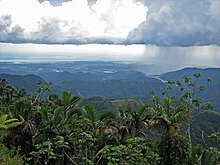 Spanish, English, French, Dutch, Haitian Creole and Papiamento are the predominant official languages of various countries in the region, though a handful of unique Creole languages or dialects can also be found from one country to another. Christianity is the predominant religion in the Caribbean. Other religious groups in the region are Hinduism, Islam, Rastafari, Santería, Voodoo and others. Caribbean societies are very different from other Western societies in terms of size, culture, and degree of mobility of their citizens. The current economic and political problems which the states face individually are common to all Caribbean states. Regional development has contributed to attempts to subdue current problems and avoid projected problems. From a political economic perspective, regionalism serves to make Caribbean states active participants in current international affairs through collective coalitions. In 1973, the first political regionalism in the Caribbean Basin was created by advances of the English-speaking Caribbean nations through the institution known as the Caribbean Common Market and Community (CARICOM). The influence of regionalism in the Caribbean is often marginalized. Some scholars believe that regionalism cannot not exist in the Caribbean because each small state is unique. On the other hand, scholars also suggest that there are commonalities amongst the Caribbean nations that suggest regionalism exists. "Proximity as well as historical ties among the Caribbean nations has led to cooperation as well as a desire for collective action." These attempts at regionalization reflect the nations' desires to compete in the international economic system. Following the Cold War another issue of importance in the Caribbean has been the reduced economic growth of some Caribbean States due to the United States and European Union's allegations of special treatment toward the region by each other. During the US/EU dispute the United States imposed large tariffs on European Union goods (up to 100% on some imports) from the EU in order to pressure Europe to change the agreement with the Caribbean nations in favour of the Cotonou Agreement. Farmers in the Caribbean have complained of their falling profits and rising costs as the Lomé Convention weakens. Some farmers have faced increased pressure to turn towards the cultivation of illegal drugs, which has a higher profit margin and fills the sizable demand for these illegal drugs in North America and Europe. The European Union has also taken issue with US based taxation extended to US companies via the Caribbean countries. The EU instituted a broad labeling of many nations as tax havens by the France-based OECD. The United States has not been in favor of shutting off the practice yet, mainly due to the higher costs that would be passed on to US companies via taxation. Caribbean countries have largely countered the allegations by the OECD by signing more bilateral information sharing deals with OECD members, thus reducing the dangerous aspects of secrecy, and they have strengthened their legislation against money laundering and on the conditions under which companies can be based in their nations. The Caribbean nations have also started to more closely cooperate in the Caribbean Financial Action Task Force and other instruments to add oversight of the offshore industry. One of the most important associations that deal with regionalism amongst the nations of the Caribbean Basin has been the Association of Caribbean States (ACS). Proposed by CARICOM in 1992, the ACS soon won the support of the other countries of the region. It was founded in July 1994. The ACS maintains regionalism within the Caribbean on issues which are unique to the Caribbean Basin. Through coalition building, like the ACS and CARICOM, regionalism has become an undeniable part of the politics and economics of the Caribbean. The successes of region-building initiatives are still debated by scholars, yet regionalism remains prevalent throughout the Caribbean. The President of Venezuela, Hugo Chavez launched an economic group known as the Bolivarian Alliance for the Americas (ALBA) which saw several eastern Caribbean islands join. In 2012, the nation of Haiti with 9 million became the largest nation of CARICOM seeking to join the union. University of the West Indies, Jamaica, Barbados, Trinidad and Tobago. In addition, the fourth campus, the Open Campus was formed in June 2008 as a result of an amalgamation of the Board for Non-Campus Countries and Distance Educationn, Schools of Continuing Studies, the UWI Distance Education Centres and Tertiary Level Units. The Open Campus has 42 physical sites in 16 Anglophone caribbean countries. Dominican Republic – arroz con pollo topped with stewed red kidney beans, pan fried or braised beef, and side dish of green salad or ensalada de coditos, shrimp, empanadas and/or tostones, or the ever popular Dominican dish known as Mangú which is mashed plantains. The ensemble is usually called bandera nacional, which means "national flag", a term equivalent to the Venezuelan pabellón criollo. Puerto Rico – Yellow Rice with Green Pigeon Peas, Saltfish Stew, Roasted Pork Shoulder, Chicken Fricassée, Mofongo, Tripe Soup, Alcapurria, Coconut Custard, Rice Pudding, Guava Turnovers, Mallorca Bread.